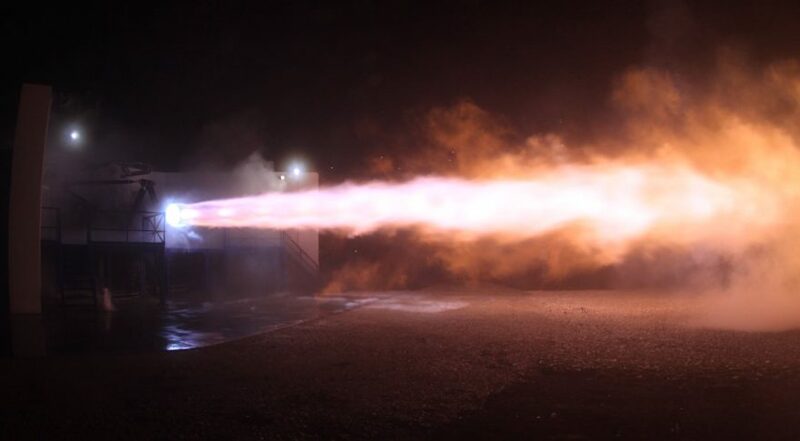 GUADALAJARA, Mexico — On the eve of a major presentation outlining his Mars exploration plans, SpaceX Chief Executive Elon Musk announced early Sept. 26 the first test of a rocket engine believed to be a key element in those plans. Raptor is designed generate 3 million newtons (675,000 pounds-force) of thrust, Musk said. That would make it comparable to another methane engine, the BE-4, under development by Blue Origin. The BE-4 is designed to generate 1.1 million pounds-force, although only when paired with another engne, according to the company’s website, giving each engine a thrust of 550,000 pounds-force. The BE-4 has undergone a series of component tests, with a full-scale engine test planned for late this year or early next year. Raptor is expected to figure prominently in the design of the “Interplanetary Transport System” that Musk will discuss in a speech Sept. 27 at the International Astronautical Congress here. That system is expected to include a new heavy-lift booster and spacecraft for traveling to Mars and other solar system destinations. Musk, in another tweet, said he would discuss two versions of the Raptor, including one designed to operate in vacuum or “Mars ambient” conditions, in his conference talk.